You can find almost every possible cuisine in existence somewhere in LA. From Persian to Ethiopian to Mexican and everything in between, the diverse food culture is one of the many characteristics that make this city great. But some cuisines will always reign supreme, ensuring a certain level of success for restaurants that other cuisines don't. And one of those cuisines is Italian-- the ubiquitous and often vague "Italian" moniker is often applied to restaurants around the globe to signify approachable Western cuisine (something we noticed when traveling in Hong Kong, Shanghai, and Seoul). However, successful Italian spots here have evolved past the generic spaghetti and red sauce offerings to create a formula for popularity across the city. That formula usually includes a modern and contemporary space, fresh takes on classic dishes, small plates, and modern pizza offerings. None of this is a bad thing; in fact, some of LA's best new restaurants fit into this category, and are excellent go-to neighborhood joints for a laid-back yet delicious meal. 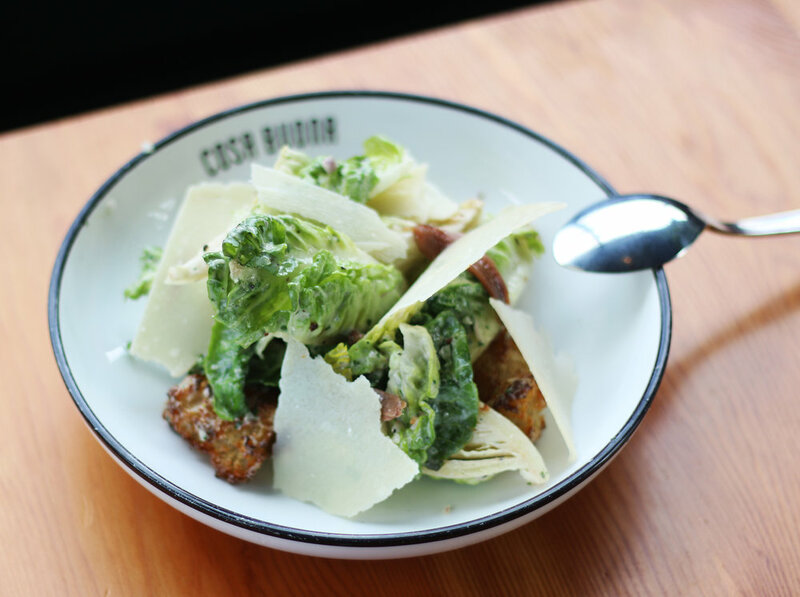 One of these new contemporary-Italian spots, Cosa Buona, has become a must-visit corner pizza joint in Echo Park since opening in May. But interestingly enough, they're bringing their casual Italian fare and celebrated pizza menu to lunch, which seems surprisingly novel, especially when mixed in with dishes like tuna sandwiches and chicken wings. We popped in on for a low-key Monday afternoon meal, and really enjoyed the whole experience. The space is a bit smaller than I imagined, but modern, casual, and somewhat upscale feeling for a corner pizza joint. Their lunch menu isn't all that different from their dinner menu except that it offers more sandwiches and fewer antipasti options. Neither menu includes any pasta, making this place all about the pizza. We started off with a Caesar, which seems like a fairly standard and obvious choice for an Italian restaurant. But I have to say, this was an excellent caesar. The lettuce was crisp and perfectly dressed, the croutons were large and crunchy, and the parmesan cheese added the perfect amount of cheese. All of the textures worked together perfectly, and it was an incredibly flavorful salad. Definitely a revitalization of a classic salad and a great way to start the meal. The tuna sandwich was definitely a surprise, as it's not exactly a lunch offering you'd expect from a pizza restaurant. But we got over this initial surprise quickly when we realized how good it was. Served on house-made bread that was fantastic, the lemon-olive relish added a nice punch of acid and brine, while the crisp lettuce and tomato were great additions. I even really enjoyed the mustard. All in all, it was an excellent tuna sandwich. Though I typically don't think to order Hawaiian style pizzas, it was fun nonetheless to try their version. I actually really enjoyed the fresh pineapple coupled with the thick Canadian bacon, onion, and smoked mozzarella. It was a really good pizza, and really well constructed; it definitely left me wanting to come back and try the rest of their pizzas! Finally, we finished with The Stepmother, a nod to Bay Cities' famed Godmother sandwich. Layers and layers of Italian meats and cheeses were topped with fresh lettuce, tomatoes, and onions, all on another house-made bread that was even more incredible than the first (seriously, the bread makes it). One of the most surprising elements of the sandwich was the vinegar that dressed the lettuce and veggies-- it added a serious punch to the sandwich, but balanced out the meat and cheese and made the whole thing super fresh and fun. It was a great sandwich, and the kind of lunch dish that will make your work day seem just a bit better. Overall, our lunch at Cosa Buona was really fun. We enjoyed their modern take on Italian classics, as well as their less standard Italian lunch offerings (the tuna sandwich). Though we haven't been yet for dinner, we definitely recommend stopping here for a casual pizza or an Italian sub if you have a moment during your hectic workday-- you won't regret it.